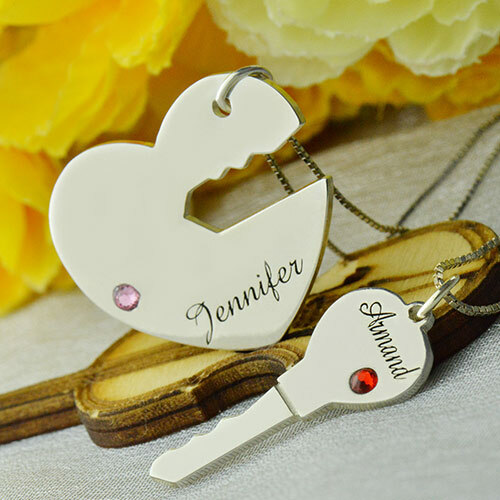 Gift For Him & Her - Key to My Heart Name Pendant Set For Couple - Who has the key to your heart? Show the world how much you love each other with this unique couple necklace!Our necklace can be personalized with his & hers names and birthstones. Choose 2 names, up to 12 letters each, and corresponding birthstones.The The necklace arrives in its own gift box, ready to be presented as a delightful gift. 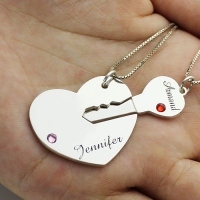 Now that you've discovered the key and heart style and sentiment that makes her or him smile, don't miss this unique personalized jewelry.